Note: Puget Custom Computers is a custom computer company, but we have no intentions of selling mineral oil submerged computers. This is just a fun project we've been wanting to share! We do offer do-it-yourself kits, if you would like to build one yourself. 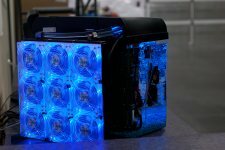 Over the years, we have seen many custom pc projects on the web that cooled a computer using common vegetable oil, including a very popular video by Tom's Hardware. After seeing all these projects, we had a lot of ideas of how we could do it better and more easily. Many projects used vegetable oil, which would go rancid after a short time. So we instead used clear mineral oil which is odorless and completely clear. We also wanted to use an appropriate enclosure -- many other projects used a clear acrylic case, and they had to painstakingly seal each rear connector to keep the oil from leaking. We wanted to put the ports on top to solve that problem the simple way -- with gravity. Other people have built systems in aquariums before, but they were always oversized and square. We wanted to use our tools and experience to custom build a solution in exactly the size we needed. In addition, we had questions about performance and long term effects. We freely share the results of our testing, including thermal performance, and long term effects. We have been running mineral oil submerged custom PCs in our office since 2007, so we have many years of data and experience to share! Standard computer components are submerged in mineral oil. The mineral oil is non-conductive, so the electronics do not short out. Heat generated by the PC is transferred into the mineral oil at a rate over 5 times better than air. The mineral oil is pumped through a radiator to dissipate the heat into the ambient air. We explore the concept of mineral oil submersion, testing with a power supply, then a low end PC, then finally a high end PC. After 3 years of experience, we launched of our 3rd revision to our do-it-yourself kits. This video showcases the features and improvements we made. What's the point of this project? Crazy overclocking? Answer: The custom mineral oil pc project has always been intended as a cool conversation piece, and a fun do-it-yourself project. While there are certainly some thermal advantages, submersion cooling is usually not the best solution for overclocking. Due to the risk of tank failure if the oil reaches temperatures above 50C, we do not recommend submerging overclocked or extremely hot hardware in this system. Why doesn't the mineral oil fry the electronics? Answer: Mineral oil is not conductive. It may look like water, but it behaves very differently. Pure mineral oil does not have the free electrons necessary to conduct electricity. What mineral oil do you use, and where do you get it? What about using Glycol, Motor Oil, Mono Ethylene, Mono Proyplene, Vegetable Oil, etc? Answer: We have not tested any other oil types in our aquarium system. We recommend using only Crystal Plus 70T White Mineral Oil for this project. Won't the mineral oil put too much load on the fans, causing them to fail? Answer: No, we have not experienced this. Even if they did fail, it wouldn't matter as the fans themselves do not actually circulate the oil very much. We leave them running just because they were fun to look at, and to answer just this question! After years of operation, our fans are spinning exactly like they did at the beginning. Won't the mineral oil eat away at the rubber, making capacitors blow or components fall apart? The only other problem is with adhesives -- the label stickers on the memory came off, and the adhesive backing on the weather stripping became useless. However, it seems somewhat selective. The label stickers on the video card and motherboard are just fine. But to answer the cries of doom and gloom -- we've seen no indications yet. All the rubber seals are intact, and the capacitors are completely unaffected. It seems as if we'll be able to run this system for quite some time, if not indefinitely. Won't the air bubbles introduce water through air humidity? Answer: Any water introduced would sink to the bottom because it is more dense than the mineral oil. This is good, because there is a gap of about a half inch before it hits any electronics. So, we should be able to see it pool there and have plenty of time to react. After many years, with the bubbles running 24 hours a day, we do not see even a trace of water. It is possible it will be hard to make out since the mineral oil is clear, but the difference in density should give us a slight "lava lamp" type appearance. How often do you have to add more oil? Answer: Our first setup had a problem where oil would wick down the cables, causing a very slow "leak." We solved this issue by having no cables run directly into the oil, but rather use a connector at the top of the tank. This breaks the suction or siphon effect. Since then, we have noticed absolutely no drop in oil level. This is fake, there is no way this would work. Answer: You're welcome to come by and give it a look in person! Directions to our Seattle facility where it is on display can be found on our Contact Us page. Where is the hard drive and CDROM? Answer: We didn't submerge the hard drive, but rather hid it inside the plastic molding on top of the aquarium. There is no CDROM drive -- we plug in a USB drive when needed. Why didn't you submerge the hard drive? Answer: While the oil is not conductive, it is viscous. If oil were to get inside the hard drive, that would be the end of the drive -- the platters wouldn't be able to spin at full speed, and the read heads would be restricted from free motion. Since hard drives have small holes to equalize air pressure, oil will get inside. Trust us. We tested it. However, SSD drives would definitely be no problem. Where did you get that radiator? Answer: Our original radiator is imported from Germany, and is no longer available. We now keep appropriate radiators in stock ourselves. Answer: No. They would die. OK. No fish, but how about C:\HORSES ? Do you have other questions? Email us and we might add it to this page! Why are we selling DIY kits? 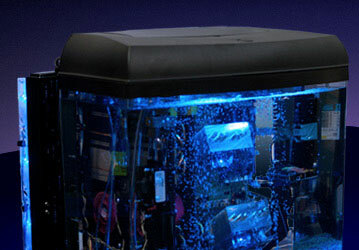 Having created three revisions of the aquarium computer, and observing their operation for years, we have gained extensive experience in building aquarium computers. We know first-hand that it takes endless hours to determine what parts you need, find a source, and wait for them to get in. What's worse, with something this customized, it often takes multiple attempts to find the parts that fit properly and work just right. After building our second revision of aquarium computer, we realized that we've done all of this work, and that we should share it with everyone! By offering these DIY kits, we are saving you very large amounts of time spent on research, ordering, and mistakes. The end cost of the project is much lower, because you can get in the right parts, the first time. Since we are ordering in the parts in bulk, we are able to get the parts cheaper, which allows us to make the margin we need to fund the project, while continuing to offer them at a lower price than you'd get if ordering them one at a time from various sources. It's a win for everyone! Harddrive Mounts 1 x 2.5" 2 x 2.5" 1 x 2.5", 1 x 3.5"
Tubing Size 1/2" 1/2" 1/2"
As a do-it-yourself project, Puget Systems takes care of all the hard work and planning with the kit contents, but there are still some items you will need to obtain on your own. View this page to make sure you have everything you need! 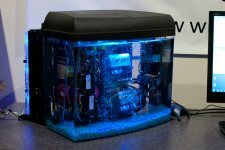 A mineral oil submerged computer has some unique needs from the computer hardware you put inside. This page details our thoughts and tips about various computer components.